Perhaps more than any other economist, Dean Baker closely monitors the mainstream news media through his blog “Beat the Press,” which offers lively press criticism on economic reporting on a daily basis. Baker obliged with the following suggestions for reporters and editors for future stories, as well as taking some shots at past reporting on the economy. Baker believes too much of the press reports uncritically that the issue of rising deficits in this time of hoped-for recovery is perhaps the most serious economic problem the country faces. Many reporters and editors (and editorial writers) covering the economy either don’t understand or fail to report that the deficits caused by stimulus spending are integral to lowering unemployment, he said. The mainstream news media should make sure that, in any discussion of the deficit, they make it clear that many economists regard the deficit as manageable and favor adding to the deficit by spending more, not less, federal stimulus to reduce unemployment and to bring about a true economic recovery. Baker said that the mainstream press "did a horrible job" of explaining the debate over President Obama's economic stimulus plan. “The numbers that were tossed around in most news stories about the amount of stimulus needed were not put in any context of what they were based on,” Baker said. “The issue was generally reported as a debate over numbers” -- the amount the President was seeking, or the number that the Republicans or Democratic members of Congress felt was appropriate (or politically feasible), and not what the basis was for any of those numbers. Baker pointed out that there is a rule-of-thumb formula (known as “Okun’s Law”) that pro-stimulus economists were using to determine approximately the amount of an appropriate stimulus program. The mainstream press, however, seldom explained that there was, in fact, a mathematical basis for the figures that stimulus advocates were putting forth, unlike the case of most of those in Congress who were calling for a lesser stimulus or no stimulus. “In principle,” Baker said, economists using the Okun method, “ask how much stimulus you need to make the economy produce a certain amount. You want to put the economy back to its original [pre-recession] level. To reduce unemployment by 1 per cent, you need to raise the GDP (gross domestic product) by 2 percent.” So, he said, to cut the 9 per cent unemployment rate of recent past months to the 4.5 percent that the Congressional Budget Office views as the sustainable rate of unemployment, you would need to raise GDP by 9 percent (2 times 4.5). Each stimulus dollar would be expected to have a multiplier effect of $1.50 as it goes through the economy, Baker said. (That is, $100 of stimulus would be expected to raise the GDP by $150.) Using the Okun method and factoring in the multiplier, Baker said he favored a stimulus of $900 billion for two consecutive years -- far more than the $780 billion package ultimately favored by President Obama and enacted by Congress. Baker likewise sees those he terms the “no stimulus” crowd as being wrong from an economic standpoint when they issue dire warnings in the press about the trade deficit and the low value of the dollar, and simultaneously call for a stronger dollar and a lower trade deficit. Rather, Baker said, “the higher the dollar, the higher the trade deficit. A high dollar makes U.S. goods expensive to foreigners and imported goods cheap for people in the U.S. Therefore, when the dollar is high, we buy more imports and export fewer goods,” thereby adding to the trade deficit we are supposedly trying to bring down. Baker urged the press to be more diligent in questioning those advocates of a high dollar policy along with a lower trade deficit about the contradictory nature of their position. Baker observed that there have been a number of news articles recently about big banks returning to profitability, but most of those stories fail to make the point as to how those banks are becoming profitable -- namely, by borrowing money short-term from the Federal Reserve at near zero cost and then loaning that money back to the Treasury by buying U.S. government bonds that pay around 3.5 percent interest. Baker would like to see more press attention to this aspect of bank profitability so that citizens can more fully understand how taxpayer largesse produces profits for the banks. Where’s the reporting on the fraud that led to the crash? The mortgage-related crash was the product of wide-scale criminal fraud, says James Galbraith, and people should be going to prison. Instead, he says, the press has pretty much ignored that aspect of it, treating the issue as boys-will-be boys. In the Business Sections of leading daily newspapers I sense even now a strong undercurrent of cheerleading for stock street gangbangers. These are the guys who brought us the crash and they're still out there doing their thing, i.e., making billions through risky behavior. From here it looks like status quo for those guys and the government regulators who looked the other way. So may I humbly suggest that newspaper editors consider a new daily column. It would signpost for readers where suspected IEDs litter our financial highways still. I recall the consumer columns that debuted in the 1970s. They focused our collective consciousness on unsafe products and eventually manufacturers took heed. How to reign in the radical capitalists who care not about the people they trample? 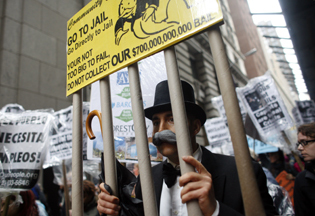 By instituting advocacy columns that point out inadequacies of the financial system. Such columns would help combat the huge lobbying effort by investment bankers to stall regulatory reform.